The “Oath stone” at the Sepukralkultur Museum (D14, Kassel). The “oath stone”, a piece of a greek archeological treasure, is transferred from Athens to Kassel by groups, collectives and individuals more or less organized. In Kassel, the stone is exhibited in Documenta 14 together with documentation of the transfer. After the event, the stone was buried in e-bay. (Download here the press release). Slideshot belonging to the installation exhibited at the Neue Neue Gallerie in Kassel during the summer’17. This theatrical project was commissioned by Paul Preciado and Adam Szymczyk at D14. Photos: Karol Jarek. The Thingspiel is the most extreme form of mass entertainment conceived by the Nazi regime. In order to carry out this mass theatre for the masses, the Nazi regime ordered the building of various types of Thingplatz throughout the Reich; these were spacious open areas surrounded by a semicircle of seating. This theatre is the inspiration for a kind of aesthetic very similar to that of the Olympic Games inauguration ceremonies of our times. The Nazi era Thingplatz on the one hand reintroduced the structure of the primitive Thingplatz where Germanic warriors of old used to gather, hold councils and celebrations (usually a forest clearing marked by a ring of stones) and on the other, the Greek amphitheatre. The various Thingplatz that survived de-Nazification can still be seen in Germany and are used for the celebration of mass events. Berlin’s Waldbühne, for example, with capacity for 21,000 people, is used to hold pop concerts. A Thingspiel is the theatrical event that takes place inside a Thingplatz. The people who become involved in these events are a collective that feel the call to personally experience a “lived epic” in which the myth of their national and/or racial identity is actively celebrated by means of choral movements, rhythmic organisation and massive group displays. In the Thingspiel, as a toxic form of participatory theatre, the audience are at the same time authors, performers and spectators of their own real fiction. The Thingspiel is a self-hypnotising device for groups that are prepared to stage their own mystical experience of a series of collective values that no longer need to be negotiated or discussed, as it is their active incarnation in the mass body of the crowd that justifies and ratifies them. The Thingspiel, which is where supposedly a community of people are given direct control of their own truth, is at the same time the most efficient device for producing the most fictional version, the most extreme manipulation – not to say extinction – of any effective control, of any critical conscience, of any dialectic presence. In short, it is the device with which the collective uses the most energy to celebrate being dispossessed of any possibility of becoming a real political subject. The aesthetics and semantics of the Thingspiel result in a wide spectrum of “performances of mass and identifying participation” whose most significant axis continues to be the enlisting of the collective body into manoeuvres of generalised consensus and unconditional acclaim. Nowadays, as part of the definitive unfolding of spectacular capitalism, the Nazi Thingspiel has become a pale prophecy of all the various kinds of “gymnastics of consensus” that the 21st century has provided for the consumer masses, all of them based on the strategic overlapping of the political, the cultural and the religious. Funeral ceremonies, re-enactments, collective stadium-based sports, cultural liturgies, the mysticism of fitness and the social networks are just some examples. It must be remembered that the root of the German word Thing is also the origin of the English thing, which generically describes a thing as a fundamental exchangeable object: the thing as the expression of an unspecified thingness; the thing as the physical and concrete example of something that can always be re-qualified, renamed, re-fetishised and, therefore, adored, celebrated, venerated, idolised. This syndrome – of an illusory materialism subject to displacement that exists only as the pretext for infinite mobilisations of the consensual collective – affects a broad range of possible objects: from the phallus (the object of specific cults before becoming the true axis of Fascist somatism) to the monument or simple goods. In this aspect, the materialism within the centre of the Thingspiel and all its postmodern copies is technically cadaverous. The result is that the movement that the collective makes in order to displace (physically and semantically) the object occupying the centre of the turbulence represented by the Thingspiel is always and only a false movement. This project by Roger Bernat/ FFF for Documenta 14 can be summed up as follows: a fake piece of marble (and therefore a fake piece of Greek archaeological heritage) is sent from Athens to Kassel. Diplomatic offering? Archaeological goods? Contemporary art piece? Monument? Corpse? Taxes due to the International Community? Typical produce? Forensic evidence? 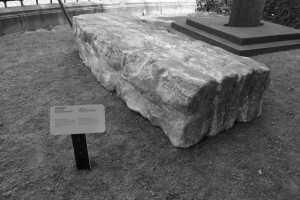 The existing or resulting collective agrees to physically manage the journey of the stone to Kassel – that is, of the journey that will turn an inexpressive copy of an inexpressive piece of stone into a magnet for cultural attention in the most important cultural event – and therefore also accepts managing this second aspect of its transmigration, which is symbolic, because it refers to the “fictions of valour” (cultural, religious, memorial, nostalgic, funereal, commercial, etc.) which the stone manages to take on thanks to the mobilisation of the collective around it. The project is therefore based on a fictional pact with the collective, which, by self-organising, organises the theatrification of the object it is moving or around which it moves; it accepts, in short, to celebrate around the stone a copy of the Thingspiel that is sufficiently conspiratorial to become a genuine anti-Thingspiel. If the former encouraged the blind participation of citizens in a fiction that was being passed off as true, the latter allows the dialectic creation of a truth that is known to be fictional. Thus creating around the “monolith” a multifaceted truth, a mysticism so dubious that it must inevitably be reconfigured as a shared (and therefore extraordinarily complex) form of political irony. Each of the participants will reconcile the specific dramaturgy of his or her own irony. Because the irony of their mobilisation depends on the values or positions that they wish to inscribe on the stone. For this inscription to be theatrical, it is vital to maintain intact the optimism particular to the Thingspiel: the stone is only the pretext of good intentions. The worst intentions, the most controversial programmes, the negativities, must be negotiated through the positive fiction constructed by the collective. The Thingspiel, it must be remembered, is a variation of the German traditional Festspiel: spectacle as liturgy, ceremony and celebration of the values of the people. Those responsible for the project see it as a dialectical questioning of the idea of success. They believe, in short, that within the framework of their participatory device, indifference, unwillingness to take part, even non-participation contribute to meaning just as much as the self-mobilisation of the “mobilised” collective. The failure of the project in itself or of itself would mean absolute success, poetically and ideologically, in relation to the project-for-Documenta. Failure is part of the state of grace that comprises the mission, the inscription, the official journey, the city walkabout, the Balkanic excursion, the flight, the party, the procession, the wandering, the drift, the banishment, the migration, the deportation, the misfortune of this fake Greek stone. The stone will not arrive in Kassel carrying truths or histories. It will arrive in Kassel carrying myths and tales, ghosts and lies. It is neither a document nor a monument: if anything, it is a nocument. Ghost ship, Trojan horse, poison candy. Undocumentable noxiousness. It would be a mistake to see the project as a genuine encounter between artists, collectives or individuals, all moved by a benevolent attachment to truth. If that were the case, Documenta would simply have to document the edifying advent of an exchange of truths. It is more accurate to see it as an unspecified festivity bringing together artists, collectives or individuals moved by a cynical fondness for revealing jokes, for half-genuine simulations, for the mot d’esprit and for impure truths that only produce illegitimate, unpresentable, useless, contradictory documents. The stone maintains a vague (or perhaps vagrant) relationship with the documentary poetry of the artistic and curatorial frame in which its physical and symbolic excursions take place. 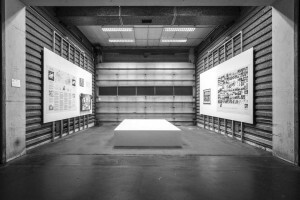 The structural risk that Documenta 14 took on when it re-created itself among the economic and social traumas of Greece was to back the ideology whereby the poor in everything else are rich in truths; and that these truths may be consumed in the morally and culturally balsamic form of a document, which is in fact the poorest type of art form of the poorest arts dedicated to poor artists: a confession turned into confessional art. We maintain the absolute right of the poor to lie.